The 81 Tasks offered are a unique set of hunting tasks customised for Medivia. You can accept and turn in these tasks in Thais, upstairs the house north west of the depot, speaking with Radek, or the corresponding NPC's in Carlin or Venore. A task is there to foster the RPG gameplay in a special way. Any task will eventually benefit you with a reward. The reward may be gold, experience or a special item. Here is a list of available tasks. - You can only have one task running at a time (not including faction or tasks). - If you cancel a task your progress is lost. - YOUR summons can kill Monsters while YOU receive the kill. - You can only complete a task once, they are not repeatable. 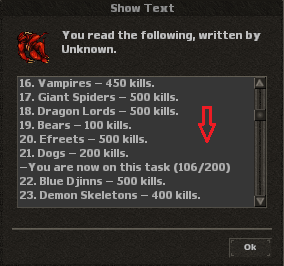 - You can see which tasks a player has done by looking up that player's character page. - In team-hunting situation the rule follows: The one who gets the last hit earns the task point. - If you forgot about your task, then you can always ask the NPC which task you're on. Say Hi / yes / Tasks, and a window will pop up. You can also check your current quests in the "task" area. Radek: Welcome "Name", do you wish to hunt some monsters? Radek: Great! I have several tasks for you, for each of them there are rewards. Radek: Here is my list of tasks for you, do you wish to hunt some monsters listed there? Radek: Which monsters would you like to hunt? Radek: You are now on (Name of Monster) hunt, good luck up there buddy! How to finish a task? Radek: Congratulations! By completing this task you shall receive "Reward". Radek: Do you wish to cancel your current task? I have to warn you though, if the task is not finished you will loose your progress! Radek: Your task is canceled. This page was last edited on 8 April 2019, at 23:10.